If Charleston crowds had their way, Madison Keys would have been the newly crowned Family Circle Cup champion. But Angelique Kerber was too tough, too consistent, and too good today, as she pulled off a brilliant victory, 6-2, 4-6, 7-5, to win her first career clay court title. The prestigious title is Kerber’s fourth overall. In 2014, she played in four finals but won none. Today adds to her record in finals, bumping it up to a more respectable 4-9. Kerber and Keys had last played in the finals of Eastbourne last summer. That battle played out to a similar script: three knock-down sets with momentum shifts, and roaring fans after each exhilarating point. Kerber will rise to No. 14 when the WTA next posts its rankings, while Keys will rise to her highest ranking of No. 17. Even though Keys lost, she will move up to No. 6 on the Road To Singapore race rankings — a list that only charts player results for the 2015 season. 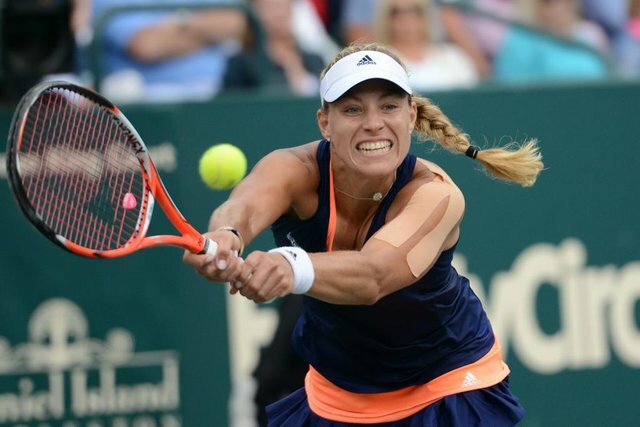 Neither woman considered herself a clay-courter, but Kerber does join a worthy lineage, now the third German woman to win Charleston since Sabine Lisicki in 2009 and Andrea Petkovic in 2014. Steffi Graf, though, still leads the way for all German women with four titles between 1986-89, and another in 1993. During her career, she won 20 consecutive matches at the Family Circle Cup. Kerber’s game was so spot on with accurate ball placement and gritty determination that she broke Keys in the first game of the match. Impressively, the American No. 7 seed had not been broken the entire tournament. Keys conceded that she started slowly, wracking up early errors largely due to nerves. By the second set, however, she’d settled in to more consistent play and a more patient attitude. In the third, she went up a break to 4-1 that gave hope to an audience anxious for an American champion. It was Kerber who truly upped her game when it matter. Had the momentum accelerated along Keys’ powerful style in the third, the story line and score would have read differently. Kerber used the words from Coach Torben Beltz to raise her game. At 5-games apiece, Keys double faulted, giving Kerber the green light to serve for the title. She closed it out at love, a convincing way to end a revitalizing week. The win lifted Kerber’s spirits and confidence after weeks of uncertainty in her camp. Those insecurities stem back to 2012 when she split with Beltz and hired Benjamin Ebrahimzadeh. At the time, Kerber was ranked No. 5 in the world. However, the new relationship began to unravel in the middle of 2014. She lost early at the US Open and lost both matches at Fed Cup in the fall. Kerber then went out in the first round of the Australian Open and the second round of Dubai. Victoria Azarenka, on her own comeback trail, pummeled Kerber in Doha, also in the first round. Ranked No. 11 at the end of February after 143 weeks in the Top 10, Kerber announced the end of her coaching relationship with Ebrahimzadeh. 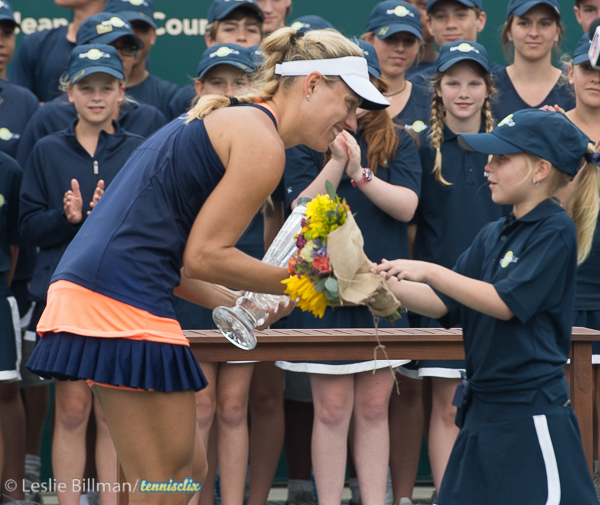 “I mean, to win the title here in Charleston after really difficult weeks that I had – I’m feeling great,” Kerber said with an authentic hint of gratitude. Obviously, she and Beltz have reconnected in a positive way. Doubles’ icon, Lisa Raymond, was here all week coaching Keys, in lieu of John Leach and Lindsay Davenport. Over the next few days, Kerber will fly to Sochi, Russia, for Fed Cup next weekend. From Fed Cup, players will head to Europe for the up-coming red-clay season. Women will converge on Stuttgart in a week and then travel to Madrid and Rome, plus other tournaments, before entering Paris and the second Grand Slam of the year, Roland Garros. Will Kerber’s and Keys’ week in Charleston propel them to greatness, during this dusty part of the season? What did you think of the Family Circle Cup final? Sound off in the comments! Haven’t Keys and Kerber played three other times? Angelique beat Madison in straights twice on hard in Australia, I think one in 2013 and one in 2014 before they played the Eastbourne final? You are right. They have now played a total of 4 times with Kerber up 3-1. They did meet at the AO in 2013, Sydney and Eastbourne in 2014, and Charleston last week. They’ve played on hard, grass and clay. Madison has only won Eastbourne, grass, which was a final and her one title to date.